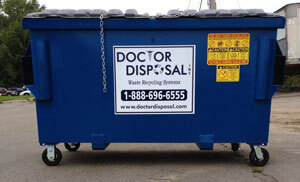 Doctor Disposal brings more than three decades of waste hauling and disposal experience to the South Shore Area. Our knowledgeable team is able to customize a disposal plan for your project whether you need a single 10 yard dumpster for a small garage cleanout or multiple 40 yard bins to accommodate a large-scale commercial demolition project. Our expert team will help you determine the correct size dumpster for your dumpster rental in Quincy MA. 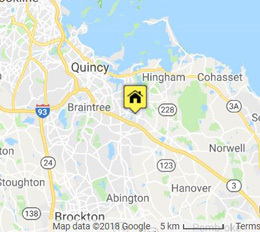 We serve the South Shore area, including Weymouth, Brockton and Quincy. We’re an environmentally-friendly company that recycles whenever possible. It’s important for us to promote a healthier, more sustainable disposal solution for Massachusetts residents and business owners. We’re able to accommodate any size cleanup ranging from small residential projects to total demolition debris removal. Our roll-off container capacities range from 10 cubic yards to 40 cubic yards. **Additional charges for mattresses, freon items, tires, tv’s, computer monitors, humidifiers, microwave ovens, etc. Our experienced team will help you choose the ideal container for your project based on the type of debris, amount of it and your budget. We deliver your container fast – as soon as the same day – and place it right where you need it for easy loading. 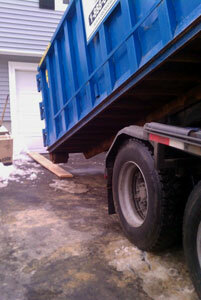 We’ll even place boards beneath the wheels of the dumpster to further prevent damage to your driveway. It’s all part of Doctor Disposal’s commitment to go the extra mile for our customers! 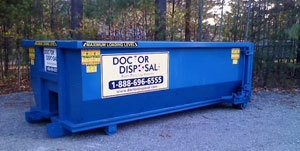 Why Rent a Dumpster from Doctor Disposal? Swift delivery and pickups. Same-day service is available! 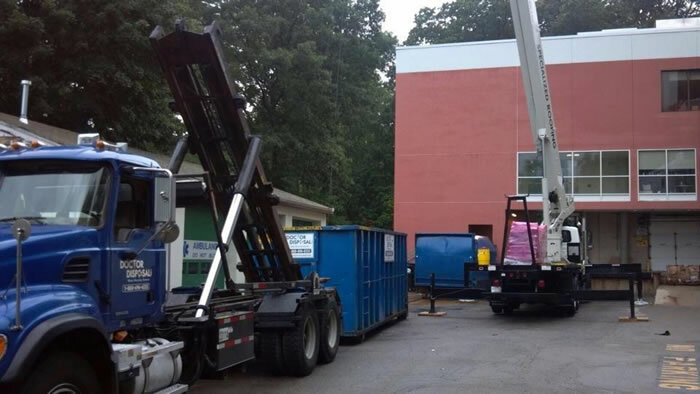 Need Commercial Front-Load Dumpster Service? We have the Solution! Doctor Disposal has a variety of front-load container styles to choose from, including upright, slant-style and dock loaders. Our container sizes include 2, 4, 6, 8 and 10 yard capacities. We can accommodate apartment complexes, condominiums, retail shops, commercial businesses, multi-family housing and more. Contact Doctor Disposal today to discuss a free customized disposal plan to meet your needs. We offer disposal and recycling solutions. Doctor Disposal is an eco-conscious waste hauler that recycles as much as possible in an effort to keep the Massachusetts environment clean and beautiful.